Last year ITV ran a fabulous documentary called ‘Girls With Autism,’ about Limpsfield Grange School, the only state-run boarding school for autistic girls, in England. It was a fascinating insight into the school; and the girl’s stories warmed the hearts of the nation. After connecting with her on Twitter, the Headteacher of the school, Sarah Wild, shares with us what she wants the world to know about autism. Autism Awareness Month this April is championing the idea that we should aim for better autism awareness and autism acceptance. However I think this is setting our sights a little low. I think we should be aiming to celebrate autistic innovation. Being the Headteacher of what is fondly referred to by comedians as the St Trinians of the autistic world, is a job that is terrific and terrifying in equal measure. The girls have taught me many things; to be braver, to be bolder, to make more demands and to be the best version of myself that I can be. However the most important lesson that the girls have taught me is that autistic teenage girls are actually the best innovators in the world, because they don’t think like anyone else and they are fearless. My experience of autistic innovation led to us writing our novel M is for Autism. A group of staff and students from Limpsfield Grange were at the Autism Show in London. Beth, a Year 11 student, was cross. Cross that all of the literature and representations of autism that she could see were male. Beth stomped about the event scowling, then came back to us demanding that we should write a book that “Told it like it was for autistic girls.” I said that was a great idea, but she would have to find someone to give us some money to do it. “Fine” Beth responded “I’m going to find someone right now to make that happen!” And with that she was off through the throngs of delegates. Thirty minutes later Beth returned with an excited official from the NAS. He was animated and excited and brimming with enthusiasm for our novel. Within half an hour Beth had pitched an idea and secured funding to enable us to write a novel. I was in awe. Sometimes not seeing the subtle nuances of neurotypical social niceties can be very helpful, and it certainly gets things done, and fast. In my experience, autistic girls think outside the box that neurotypical people have designed. And that is a good thing. Creative solutions are what propel a society forward, they help societies to progress and develop and evolve. Who wouldn’t want that to happen? So, next time you hear someone being negative about autism tell them about fearless Beth. Tell them to be grateful that we have creative; innovative; confident autistic young women who won’t let someone else write their story. Sarah Wild is the Headteacher of Limpsfield Grange School in Surrey, state funded residential special school for girls with communication and interaction difficulties including autism. Sarah is interested in how autism impacts on, and manifests in girls and women, and in raising awareness of how autism in girls can present differently to autism in boys. This is the reason why she and the team at Limpsfield Grange made “Girls with Autism,” an ITV documentary which was aired in July 2015. 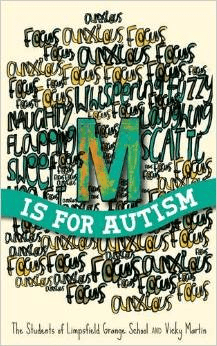 Their students have also written the novel “M is for Autism” with author Vicky Martin about their experiences of being autistic teenage girls. They are currently writing the sequel. Sarah is interested how we promote and sustain positive emotional wellbeing and mental health in young people with special needs in education settings. Sarah has the privilege of being a Headteacher who works with a school full of curious, kind, compassionate teenage girls who will one day change the way we see the world; and a reflective and energetic staff team who have the capacity to teach her new things every day.